Place the coconut oil, cacao powder, honey and vanilla in a small saucepan over low heat and stir to combine. 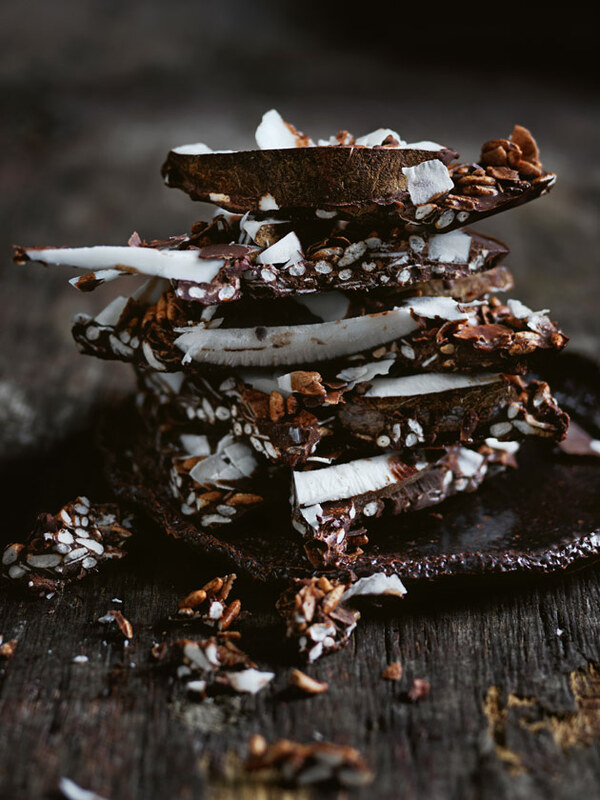 Place the fresh coconut, puffed brown rice, cacao nibs, salt and ½ cup (25g) of the flaked coconut in large bowl. Pour over the honey mixture and mix to combine. Line a large baking tray with non-stick baking paper and pour the mixture over. Top with the remaining flaked coconut. Freeze for 1 hour or until set. Break into shards to serve. Serves 8–10. + Fresh coconuts are available from greengrocers. To crack them open, pierce the eyes with a screwdriver and drain the liquid. Preheat oven to 220°C (425°F). Place on a baking tray and cook for 5 minutes. Remove from the oven and carefully crack open with a hammer. The flesh can be chopped or shaved. Note: You can keep this refrigerated in an airtight container for up to one week.